I was in Preah Khan’s Hall of the Dancers, hoping that one of the female celestial dancers carved on the pillars and lintels would materialize and join me. Alas, they remained in their heavenly realm. But I got a deeper appreciation of this key room in one of the Khmer Empire’s greatest buildings. Step inside and discover what no book has detailed yet. Today we see the enduring stones, but dance was a central art in Angkor. Angkor Wat has its more than 2,000 apsaras (the celestial dancers I was hoping to meet–but they only entertain Hindu gods). 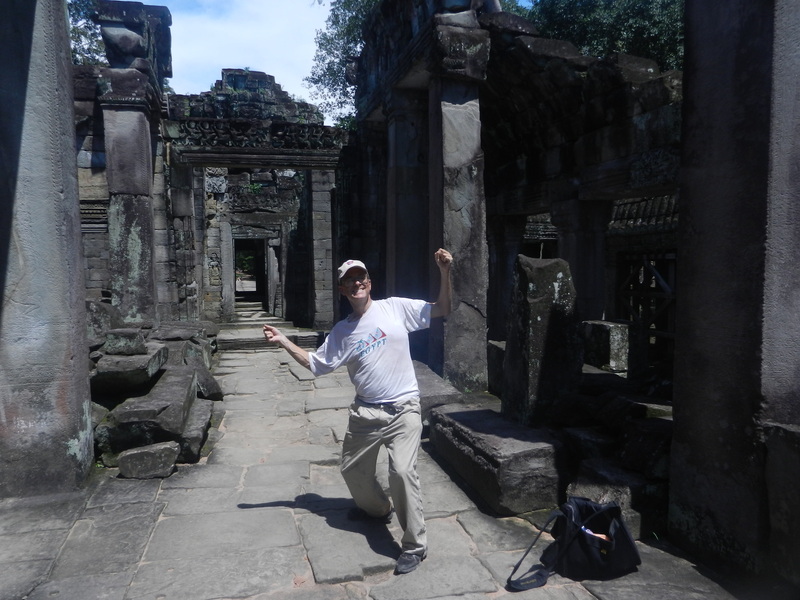 But all 3 huge universities/monasteries which Jayavarman VII founded around 1200 (Preah Khan, Ta Prohm, and Banteay Kdei) have a Hall of the Dancers. You can’t miss it–it’s just before the central section. 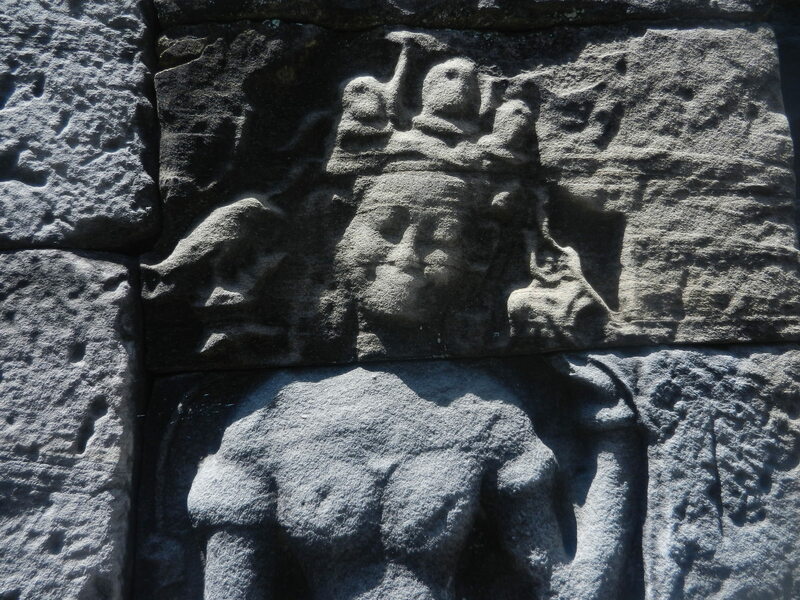 So I examined these buildings more closely this time, and I found them as pleasing as the apsaras. 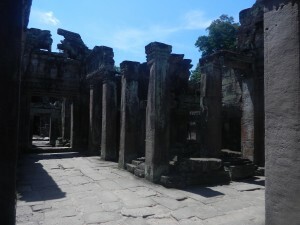 All the photos in this post are from Preah Khan. A row of dancers graces the lintels over the hall’s portals, and niches surrounded by energetic floral patterns preside above them. 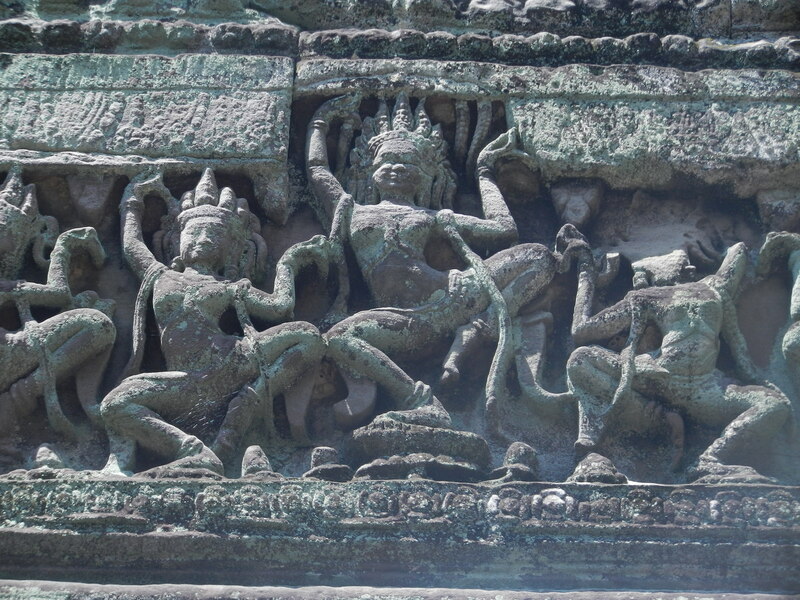 The apsaras aren’t as elegant as Angkor Wat’s, but they’re more lively. 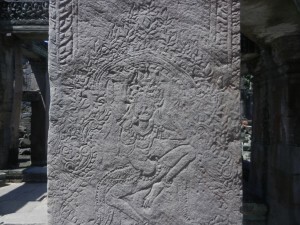 Carvings of apsaras also enliven the pillars. And they grace the walls around the pillars. 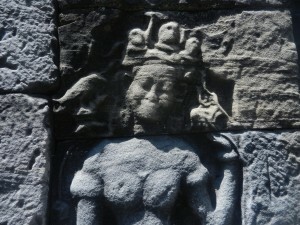 This one twirling her hair’s in a common Angkor Wat pose. But more than dancers adorn the stones. The abstract designs were just as lively. But I found the hall’s proportions as pleasing as the decorations. Columns flank wide walkways that lead from the 4 cardinal directions to an open space in the center. The pillars are straight and stately, but the hall isn’t huge. So it provided an environment for dancers that was dignified, but on a human scale and well proportioned. 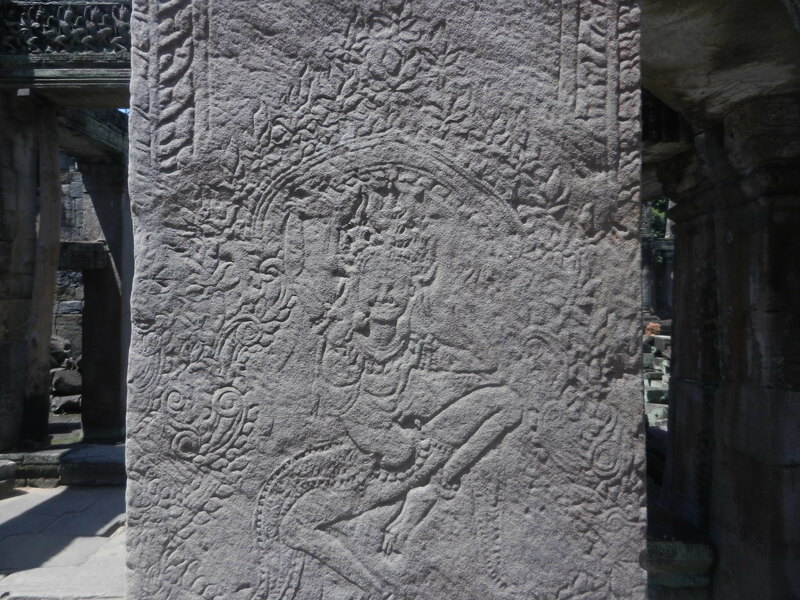 Khmers held myths about apsaras emerging from the ocean of milk as the gods and demons were creating the cosmos while stirring it. It thus would have been easy to associate dance with the basic patterns of energy that the universe emerged in. 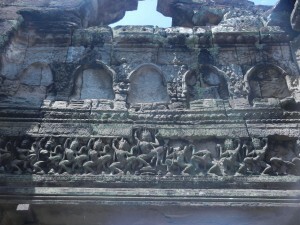 The Hall of the Dancers in all 3 of Jayavarman’s complexes is east of the central section. So the sun would have greeted it when it rose. 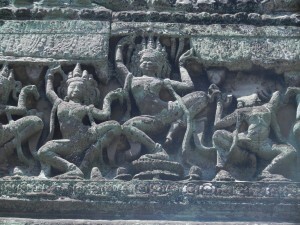 Since these 3 establishments were mainly for Buddhist worship, some scholars think that dancers might have enacted the Buddha’s birth. All of these themes are about creation. Dancers probably embodied nature’s creative energies in this handsome room. 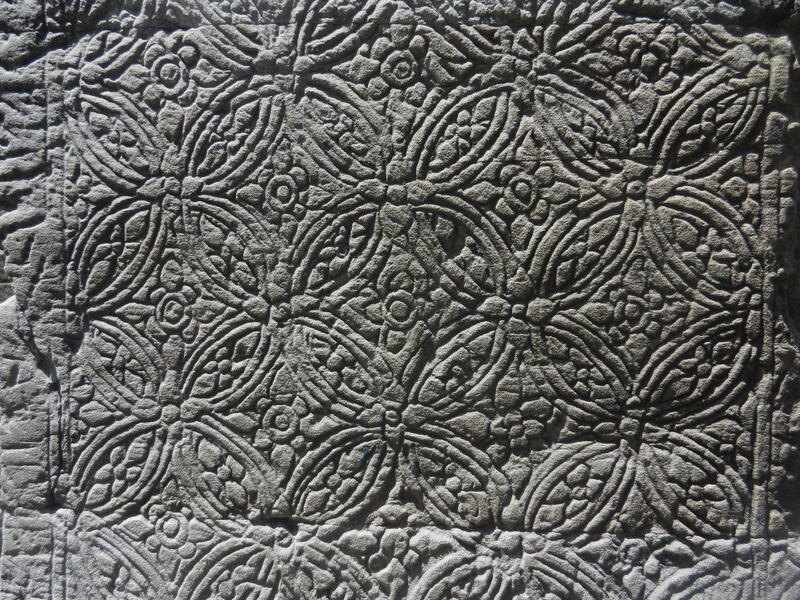 If so, its symmetry patterned them in ways that allowed civilization to thrive. I found the image so attractive that I stopped hoofing around and stood still to savor it for a while. 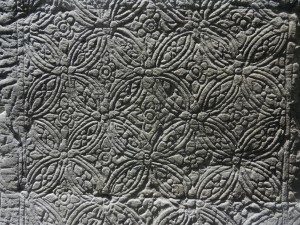 The Khmer vision of the early universe taking form was perfect. Only divinities could have enhanced it.